Some say you are not a real gardener unless you make compost, while I don’t believe this as there are many ways to feed the soil with alternative methods, I do believe its important for many reasons. Beside reducing the amount of waste entering landfill sites, you will have a useful product that benefits your garden and your gardening, especially if you propagate your own plants from seeds or cuttings. There is a lot to know about successful composting and plenty of information is available in books and on the Internet. While the basic concepts behind making compost are constant, some adjustments in methods and compost bin construction will help you make better compost in dryer weather. Many compost bin designs were developed for areas having high rainfall, moderate temperatures, and/or higher levels of humidity. Under these conditions, the compost must have a greater exposure to air to prevent it from becoming too wet and going anaerobic (smelly and unpleasant). These bins often have wire mesh or large air spaces in their side-walls. These openings on the side-walls promote aerobic conditions necessary for healthy compost. While these compost bin designs will function in arid regions, they will also require greater inputs of water to maintain proper moisture for the compost-producing micro-organisms. While compost does require adequate aeration, we can conserve some water by using solid side-walls on our compost bins. Larger diameter compost piles can also help conserve water by minimizing the surface area to volume ratio. I’ve found that solid side-walls of wood, concrete blocks, or sheet metal prevent water loss and provide adequate aeration. Solid sides help slow water loss and retain heat. If additional aeration is needed, then you can add more coarse materials or perforated drainage pipe. There are several types of manufactured compost bins. The drum type composters are great for small amounts of kitchen and garden waste. These are rotated whenever new materials are added and are easy to manage. Another type of composter is the upright bin, usually made of UV stabilised plastic. These are convenient for depositing compostable waste, but are not easy to inspect and make only small quantities of compost. A third class of composters is wooden slat or wire cage bins. These are convenient and hold larger quantities of materials, but lose heat and moisture more readily. Many medium-scale compost makers like to have multiple compost bins and there are several designs available on the Internet. Bins provide flexibility to have compost at various stages of decomposition or segregation of materials and/or composting methods. 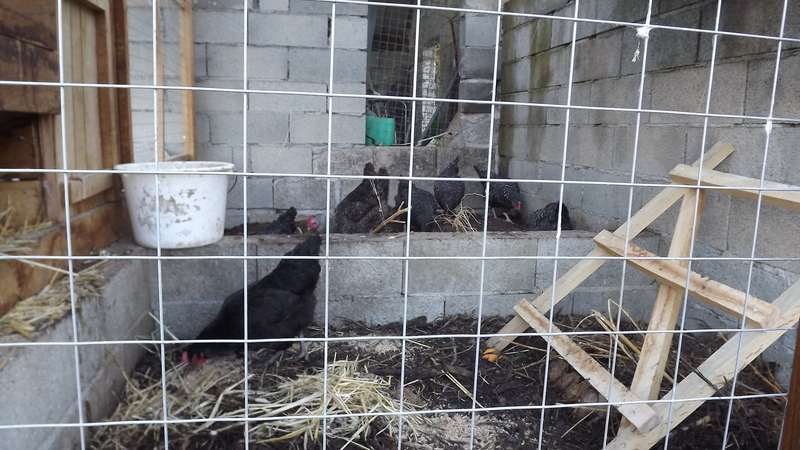 Presently we have five separate compost bins some just produce compost and other are exploited for their heat. If you are unsure of which system you should use, then try to envision the amount of waste your household generates over the course of a year. The average household with a small garden, low maintenance landscape, and kitchen waste can probably get by with a plastic bin or drum composter. If you have chickens, rabbits, and a large garden or landscape, I recommend at least two bins. With Large animals and acreage, you will definitely need large bins or possibly even free-standing piles you turn in some fashion. Regardless of methods/bin configuration, you will probably end up with about 1/2 to A 1/4 of the original volume. Remember! you can never have too much compost! Much of what goes into our waste bins, and ultimately into our landfill sites can be composted. During certain times of year, pine needles and leaves from deciduous trees are plentiful. Other compostable materials include manure, garden trimmings, weeds, grass clippings, small twigs, newspapers, cardboard, pet hair, sawdust, wood shavings, bark chips and the contents of vacuum cleaner bags. In fact, almost anything that was once living is a candidate for composting. The end product is a rich soil amendment of each gardener’s own design. Some believe grease, oil, meat scraps, human and pet excrement, and diseased plant material shouldn’t be added to garden compost, but this is not always the case. All of these things will compost. If using these items in your garden compost you need to give it longer at higher temperatures to break these items down or they may harm your soil and then in turn your plants. The most critical factor for successful compost is the ratio of carbon to nitrogen (CtoN) in the raw materials. A Carbon to Nitrogen ratio of 30 parts carbon to 1 part nitrogen is ideal. This ratio is the optimum proportion needed by micro and macro-organisms in the compost pile. The proper amount of moisture is also important. Too much moisture will prevent oxygen exchange and too little will not provide favourable conditions for the organisms to thrive. The table below shows. Carbon to nitrogen ratios of many compostable raw materials. Carbon is the main constituent of organic matter. Plants take in carbon dioxide during photosynthesis and incorporate it into cell walls, proteins, sugars, nucleic acids (DNA and RNA) and lipids (fats and oils). Just as we consume foods and convert them to carbon dioxide through respiration, organisms in the compost pile respire using the organic residues that you add to your compost. Although nitrogen is needed in smaller quantities, without it the compost will not readily decompose. Nitrogen is a major constituent of protein and nucleic acids. Most garden composters use manure, green plant residues, or nitrogen fertilizers to bring nitrogen into balance with the carbon, if you don’t keep some sort of farm animals chickens, cow’s pigs then you can increase the nitrogen by peeing on your compost or at least in to a bucket to add to the compost later. We have several dry toilets on site from which we separate the urine this is added to compost heaps or diluted and used to water mulched growing beds. The microorganisms that get the process started are in the air and soil. By adding small amounts of topsoil to your compost, you can inoculate the pile. We put any oversized material from finished piles back in to new piles to help with inoculation. The organisms living in the compost use both carbon and nitrogen to grow, reproduce, and grow more. Once their populations increase, they begin to break down the organic matter more quickly. A food chain (or a food web) with many different organisms feeding on the raw materials and each other lives within the compost pile. Fungi, Bacteria, Actinomycetes, Insects, and Worms feed on the raw organic matter. Springtails, Mould mites, Beetles feed on the fungi. Protozoa’s, Roundworms, Rotifers, and other small organisms graze on bacteria. Larger insects such as Centipedes, Beetles, Mites, and Flat worms feed on the smaller organisms, all the organisms produce waste and/or die to create the compost. These creatures may only be present at one stage or another in this trophic cycle of life but all contribute to a complex and wonderful matrix that deserves our understanding. Compost bins vary in size, shape, and materials. To start a compost pile, add alternating layers of leaves, manure (or other nitrogen containing materials), and native soil. The soil inoculates the pile with locally adapted micro organisms. Wet it down so that it is as moist as a wrung out cloth. Check the pile in a few days-it should be hot. Kitchen scraps can be buried in the surface of the pile. I have a 10ltr plastic bucket for collecting kitchen scraps. Vegetable wastes, leftover cereal, egg shells, nut hulls and anything else that we can find. We even add leftover coffee and tea (liquid, grounds, and leaves). This provides liquid and would just be added to the septic system so why not add it to the compost. A compost pile that is not working is either too dry, too wet, or lacking sufficient nitrogen. A compost pile that smells like ammonia has too much nitrogen. This can be corrected by adding carbon-rich leaves, twigs, or straw. A well-laid compost pile gets warm and smells earthy. Many people have gadgets that they use to make and monitor their compost. These include shredders, thermometers, manufactured bins, and handy gadgets to help you turn it. Composting is an art and science. Have fun, watch it, smell it, and use it well. Composting will happen with or without our help, so why not use the process to our advantage. No lame excuses. Compost need not stink or breed vermin, can be done on a small scale, and just makes good sense. People with gardens are at a distinct advantage, but even apartment dwellers can compost under the kitchen sink with the help of earthworms. There is no excuse! In theory, compost can be finished in as short as two weeks (this is the claim with compost tumblers/rotating drums). This all depends on the proper mix of air, water, and raw materials the carbon to nitrogen ratio (CtoN). Remember, a CtoN ratio between 25:1 and 30:1 is the optimal range for fast composting. As the amount of carbon increases, the composting organisms still work, just more slowly. The more slowly it composts, the cooler the temperature within the pile. This brings us to the two schools of thought on compost temperatures: hot v. cool. Of course each has advantages and disadvantages. A realistic time frame for hot compost is eight weeks. Hot composting can be likened to combustion: more air (oxygen) results in hotter compost and faster decomposition. Hot compost piles require a minimum size: at least four to five feet square and four feet high. Piles smaller than this lose heat too quickly. Hot compost must be turned often or carefully constructed to maintain the necessary level of aeration. Hot compost reaches temperatures between 44° and 70°C. The hot method utilizes thermophilic microorganisms that thrive at these high temperatures. Cool compost is more forgiving with respect to CtoN ratios. If nitrogen is in shorter supply (i.e. a high CtoN ratio), the microbial populations do not reproduce as fast. Cool compost still heats up, but only to a maximum of about 49°C. This is a “laid back” method of composting. It can take between six months and two years to finish composting. A comparison of the methods shows distinct advantages and disadvantages. Advantages of hot composting are speed of decomposition, efficient use of space, kills most weed seeds and pathogens present in the raw materials. Disadvantages of hot composting are amounts of labour needed, a solid knowledge of CtoN ratios in materials, some nitrogen is volatilized (turned into a gas and lost) to the atmosphere, and beneficial soil microbes can be killed by high temperatures. Cool compost has some obvious advantages to the casual gardener – less work. It also preserves beneficial soil microbes, conserves nitrogen (no volatilization), and new materials can be added any time. Disadvantages to cool composting are potential for nutrient losses from exposure and weathering, it takes more time to finish, does not heat kill as many weed seeds and pathogens, requires some attention to CtoN ratio and moisture as materials are added, and it can have some material that is not composted mixed in with the finished compost. Choose a method that fits your needs and personality. Our compost was usually the cool version. This was mainly because We continued to add materials to one pile. Having multiple bins or piles can allow you to have the best of both worlds: a batch of hot, a pile of recent raw materials awaiting their turn to be added to the next hot pile, and a bin or pile full of ready to use, finished product. 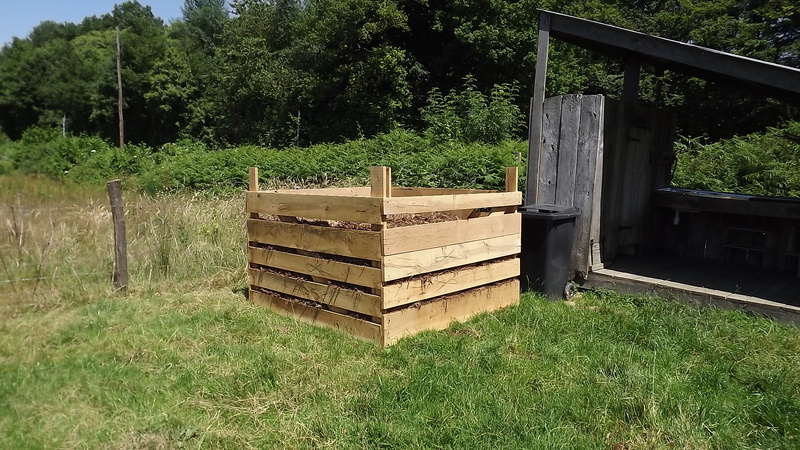 Now more often we manage hot compost mostly due to the careful construction of the pile with good CtoN ratios and mixture of different sized material to maintain aeration levels, and constant monitoring for heat, moisture and nitrogen levels. If this composting article has only piqued your interest, then I have at least done all I could ever do as a counsellor stretched your mind.